Unlike other tools, you do not need to have an intimate knowledege of the DVD structure. DvdComposer handles all the complicated stuff for you behind its intelligent interface. If you're a novice just starting out to create DVD's, you will find comfort that DvdComposer allows you to do all the cool stuff with great ease. Unlike other DVD applications, you focus mainly on your creative ideas, and do not spend time learning about internal DVD structures.DvdComposer is an advanced DVD authoring application. 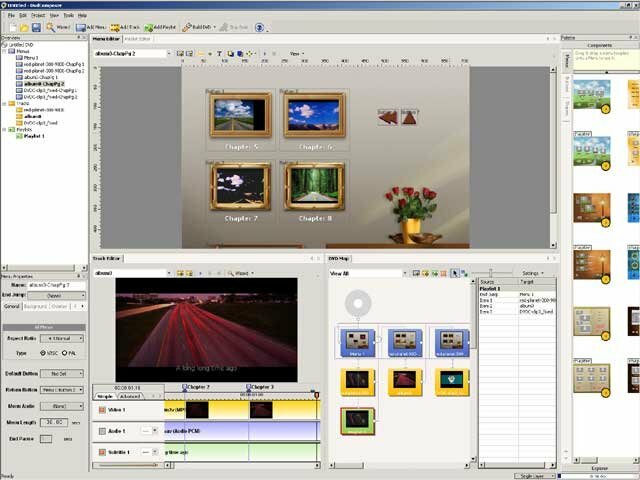 It allows you to create DVD's with flexible navigation, create stunning motion menus, and add multiple audio & subtitle tracks to your DVD. If you're an experienced DVD authoring guru, DvdComposer will save you time with its intuitive interface. Its abstraction of low-level DVD structures will allow you to focus on the task, rather than the low-level nitty-gritty DVD requirements.